Attendees offer incense and prayers in front of the Hiroshima Peace Flame. 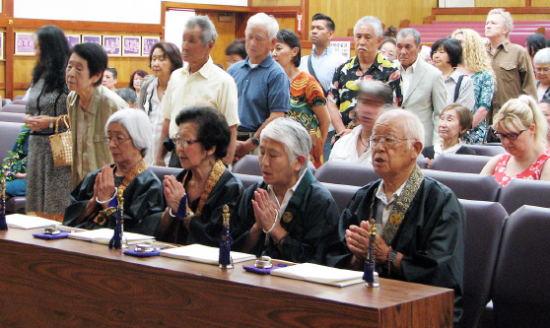 The atomic bombing of Hiroshima and Nagasaki 70 years ago was commemorated Aug. 2 at Koyasan Buddhist Temple in Little Tokyo. 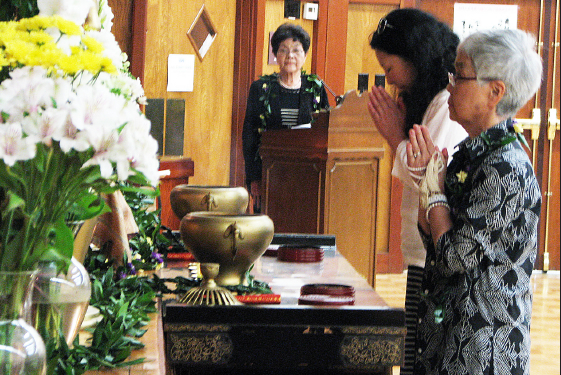 The annual memorial service in front of the Hiroshima Peace Flame was co-sponsored by the temple, the American Society of Hiroshima/Nagasaki Atomic Bomb Survivors (ASA), and the Japanese American Cultural and Community Center (JACCC). Rev. Junkun Imamura, bishop and shukan (head priest) of Koyasan, led the religious rites and gave opening remarks. Attendees lined up to pay their respects to the thousands who were killed by the nuclear blasts on Aug. 6 and 9, 1945 or died later from exposure to radiation. JACCC President and CEO Leslie Ito discussed “Sadako: Folding for Peace,” an annual program held by JACCC in memory of Sadako Sasaki, a Hiroshima girl who was 2 when the bomb was dropped and died of leukemia 10 years later. “Over the past several weeks at the JACCC, we’ve collected over 2,000 cranes from our local community … (and) hundreds of haiku for peace from countries across the world that we’ve gathered through Facebook and social media as well as people coming to art events. As a gift of peace from Los Angeles, we hope to send both the cranes as well as the haiku to be shared both with Hiroshima as well as the Emanuel AME Church in South Carolina. As temple leaders chant, memorial service attendees line up to pay their respects to the Hiroshima-Nagasaki victims. The main speaker was photojournalist Darrell Miho, who has worked with hibakusha (A-bomb survivors) as well as survivors of the 2011 tsunami in northwestern Japan. “I have heard many heartbreaking stories, and a few have really stuck in my head. There is a survivor in Hawaii who didn’t want to be interviewed on camera, but he openly talked to me about his experience. He was 18 years old when the bomb was dropped on Hiroshima. Because of the mass destruction, most of the buildings were destroyed, including the crematoriums. He said that bodies were all over the place and rotting in the heat. “There are many more (stories) like this, equally heartbreaking, each of them tragic. And while each survivor has had different experiences, there have been many similarities in the many stories that I have heard. Many talk about the dead bodies lying in the street or floating in the river. Many talk about people walking around like zombies with outstretched arms and skin hanging from their limbs. Many talk about people asking for water, and then dying after they drank it. Urging everyone in the audience to do something to make this world a more peaceful one, Miho said, “Each and every one of us has the ability to effect change because what we do affects what those around us do … If someone yells at us, our natural reaction is to yell back, which often leads to more yelling. What happens if we break that cycle? In most cases, the yelling stops. Hiroshima survivor Junji Sarashina and photojournalist Darrell Miho. 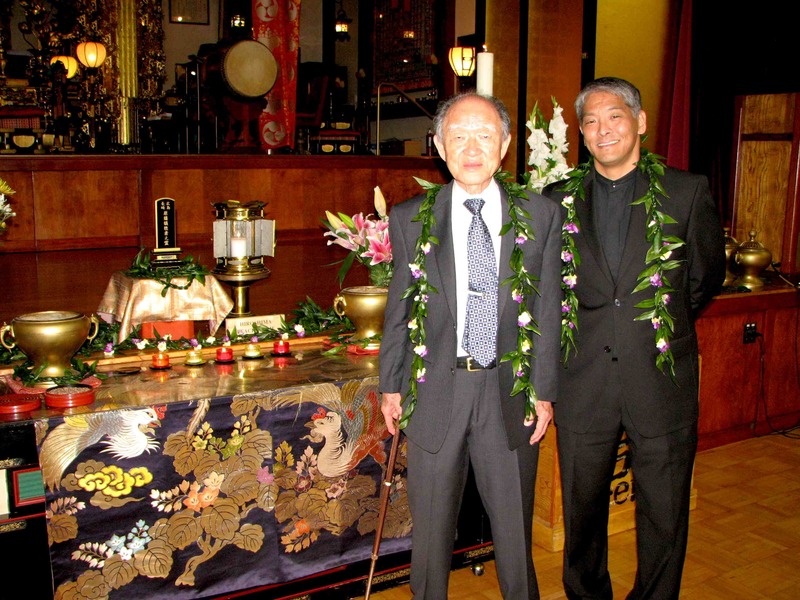 Junji Sarashina, treasurer of ASA, was 16 years old when he survived the Hiroshima bomb. “I might have seen close to 5,000-6,000 people dead,” he recalled. “You see the first people on the ground dead … you’re kind of scared. But after you see 5,000-6,000, it’s an ordinary thing. “I tried to help some of these wounded, but it was beyond what a human can do. Everybody rushed … to the Red Cross hospital. We couldn’t get any help there because all the nurses and the doctors were also the victims and they couldn’t do anything. Three days later, the doctors and the nurses from the outskirts of Hiroshima came to the city and helped the people, whatever they can do. They stayed in the city of Hiroshima for a few days, 10 days, maybe one month. “The worst thing was after one month, the doctors and nurses who came to help started to lose their hair, started to get the red rash all over them, and they became the victims of the radiation … I’m sure the same thing happened in Nagasaki too. Rev. Junkun Imamura of Koyasan Buddhist Temple, Leslie Ito of JACCC and Denise Duffield of Physicians for Social Responsibility-L.A.
Kaz Suyeishi of ASA, who usually speaks at the Koyasan service, was also in Japan to attend the 70th anniversary commemoration. Denise Duffield, associate director of Physicians for Social Responsibility-Los Angeles, announced a peace vigil to be held on Aug. 5 at 4:15 p.m. in front of the “Chain Reaction” peace sculpture at the Santa Monica Civic Center, timed to coincide with the observance in Hiroshima on Aug. 6 at 8:15 a.m. Sarashina was among the speakers at that event as well, and the Hiroshima Peace Flame was presented by Rev. Ryuzen Hayashi. Dr. Gloria Montebruno Saller of University of LaVerne announced a Hiroshima-Nagasaki exhibit to be shown on campus on Sept. 21 to mark International Peace Day. A number of other peace events were planned on or around the two anniversary dates.